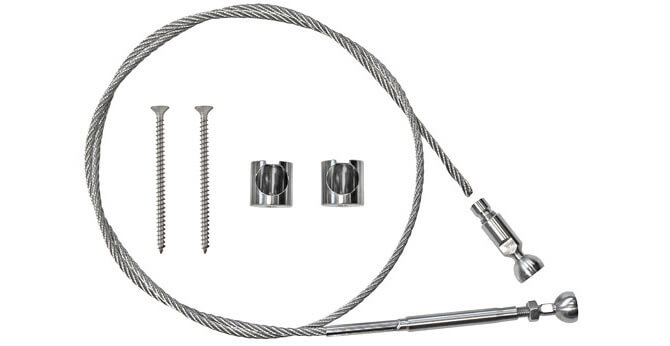 Complete flat surface mounting balustrade wire and fixings kit. Ingenious ball and socket design to allow for inclines, with all components produced from 316 marine grade stainless steel. 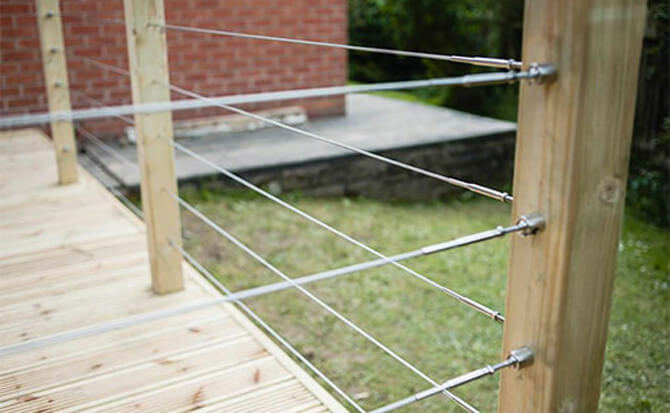 UK made stainless steel balustrade wire kits usually delivered 48 hours from order. 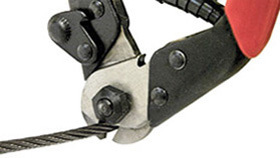 Hand Held Wire Cutters for a neat and tidy cut. Before installation we would recommend you consult with your local building control. Plan your project in advance to ensure you have the correct number of posts, wires and fittings remembering to take into consideration end post and corner post termination clearance and position. 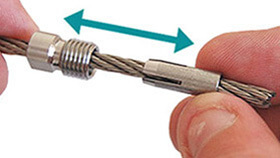 Stainless steel wire cables should be spaced a maximum of 100mm apart. Vertical posts should be spaced at a maximum of 2 metres apart to ensure a strong frame. Each cable has an adjustment of plus or minus 20mm. 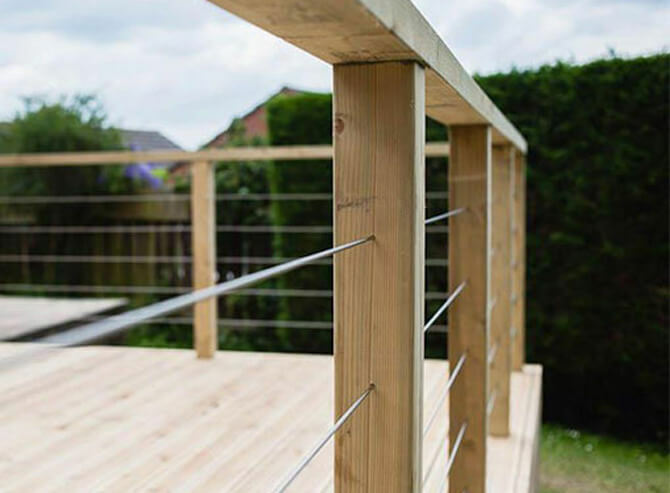 This deck balustrade wire system is suitable for mounting onto either timber posts or masonry wall surfaces using a 70mm countersunk wood screw (supplied). 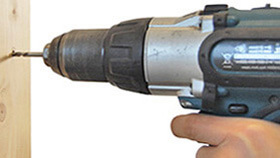 Note : If mounting onto masonry surfaces please drill a hole and insert a plastic plug before fastening. Sometimes if a wall is particularly brittle or old - a chemical resin may be applied to further strengthen the hold. You can run cables up to 10 metres! 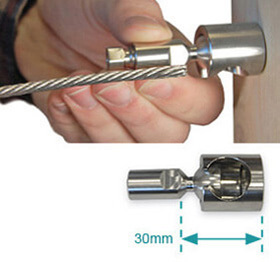 Pass cables through any intermediate posts to minimise the number of cables you'll need! 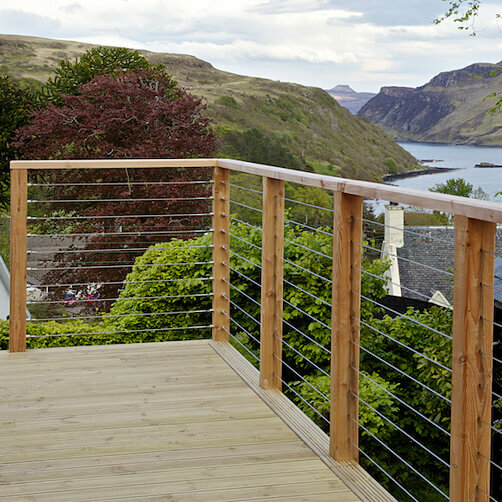 Video: Wire balustrade kits. 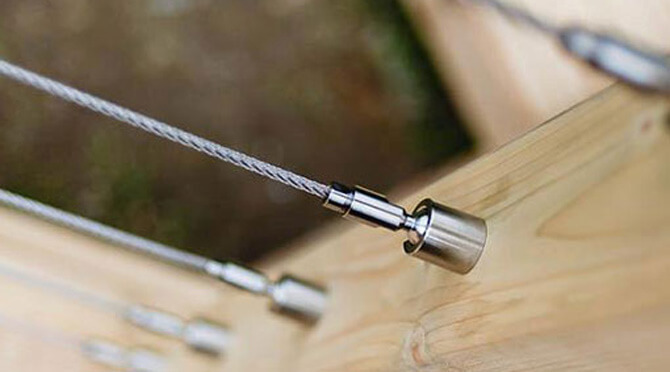 Installation guide for the self assembly balustrade wire kits. 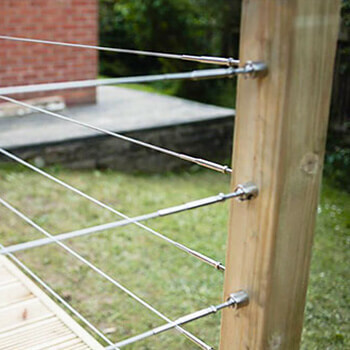 Wire balustrade kits. Installation video for the self assembly balustrade wire kits. 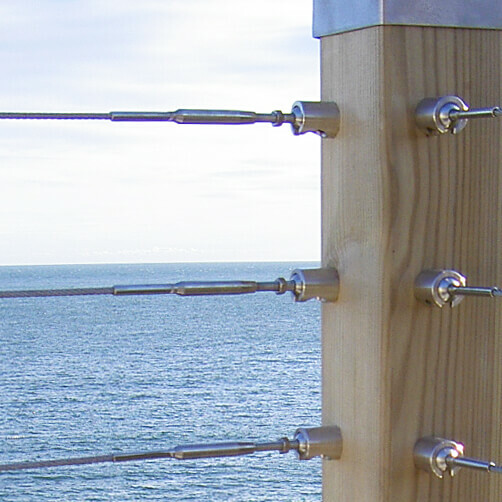 An ingenious ball and socket cable railing design to allow for inclines, with all wire balustrading components included. 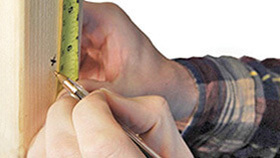 Download and print our installation advice sheet for the DIY Surface Mount Balustrade Wire Kit. 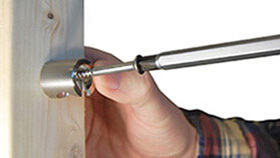 The stainless steel wood screw allows direct installation into hardwood timber (such as oak) or, if combined with the correct plastic plug, it is attachable to almost any masonry surface (we recommend a 3mm drill piece for direct installation or a 7mm if inserting a plastic plug). Using a screwdriver fix the surface mounting hubs using the stainless steel wood thread screws. 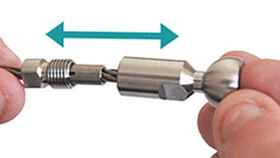 Starting with the pre-fixed tension ball end, screw out the ball end to reveal approximately 20mm of thread, you will need this to apply your final wire tension once installed. 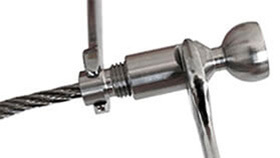 Pull the cable over to the other fixing post and align to the spanner flat of the DIY compression fitting. Note: The stand off from the mounting hub is 30mm. 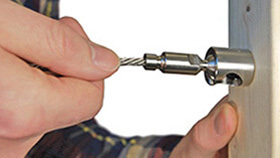 You are now ready to attach the DIY end fitting. The first step is to take apart your DIY compression fitting. 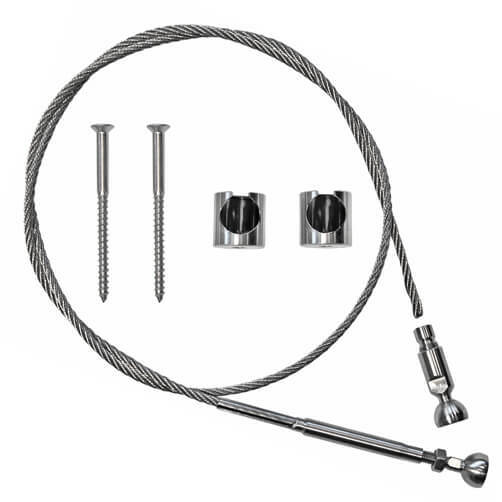 Taking the blank cable end place the nose piece over the stainless steel wire rope (ensuring the thread end is towards the end of your wire). 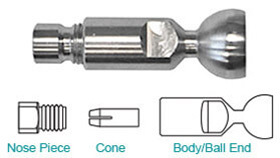 Thread the cone onto the wire and push into the threaded cone chamber. 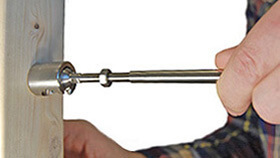 Take the stainless steel body and push onto the wire, eventually bringing the three component parts together. 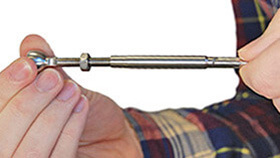 Returning to the pre-fixed ball end, simply screw in the thread using a 5mm spanner to achieve the desired wire tension. 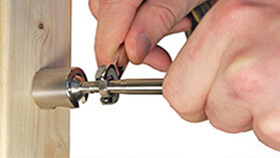 Once you have achieved this lock the nut into place using a 10mm spanner. It is important that the wire rope is not allowed to be twisted. To tension the balustrade wires, we recommend starting from the centre and working out (see example diagram below). Do not fully tighten individual wires as this will create uneven tension throughout your system, just tighten enough to hold in place. 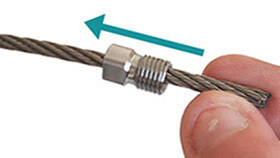 Once all your wires are installed, tighten each wire in turn by slight increments to achieve a solid and fully secure finish.